Have you seen Bartolo Colon pitch? He is worth seeing. Last year, it was amusing to watch the portly ex-Cy Young winner's return to adequacy, in his late 30s, after missing an entire season. It was a funny little joke about the vagaries of sports, or of life. Now it's baseball. 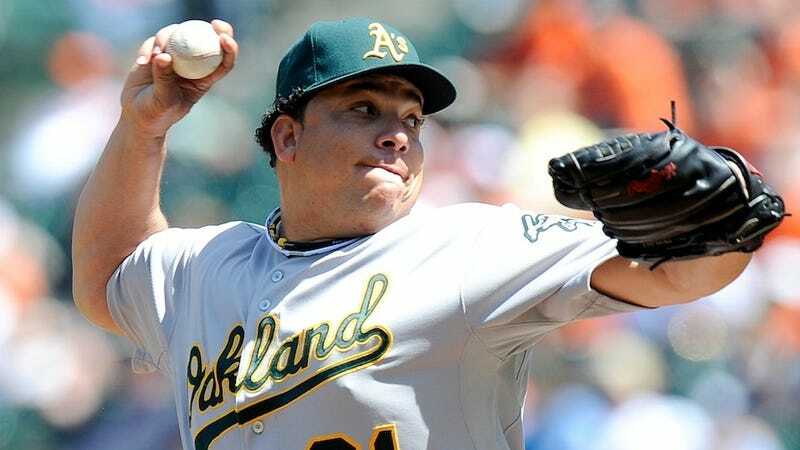 Yesterday, Colon came two tough defensive plays short of pitching a complete-game shutout for the A's against the Orioles. Admittedly, the reason that one of the plays didn't happen was that Colon himself made a wild throw to first, after hustling his overweight 38-year-old body off the mound to chase a swinging-bunt grounder. That opened the door to the bullpen, and to the winning Baltimore rally. But as long as Colon stayed on the hill, he was in total, uncanny command of the game. There aren't many other pitchers doing what Colon does. His pitching has been reduced to the basics, and then reduced even more. He turns 39 in May; he has nothing particular to prove. He's not trying to show off by overpowering hitters or making the ball do tricky things. He's not interested in being cute, in matching wits with the batter and the umpire around the corners. He simply rears back and throws strikes. One strike, then another, then another. Three starts ago, against the Angels, he threw 38 strikes in a row. He barely even bothers changing speeds. So far this season, 83 percent of his pitches have been fastballs. Fastball after fastball, in the strike zone, but placed where you can't quite get the fat part of the bat on them. You can try for the high one and pop it up, or you can reach for the low one and beat it into the ground. Suit yourself. Don't think about it too long, because you're only seeing three or four pitches, max. Bartolo Colon likes pitching, but he likes going back and sitting in the dugout, too.